As winter moves in, our beer list moves on. Just like our wine list, our beer selection continues to grow... so much so that we almost need to evaluate our selection the same as we do our wines. With each season, we need to address the different styles on our list. We like to have the variety along with the styles are hot right now. We may not have 30 different tap handles (but at least we can turn them over), but we do have a pretty nice bottle and draft selection... one that's better than ever before. This week, we are bringing in a draft beer from a brewery we have yet to feature. Revolution Brewing is Illinois' largest craft brewery that began in early 2010. Their seasonal Fistmas Holiday Ale is one you will surely want to try. Tis this season? 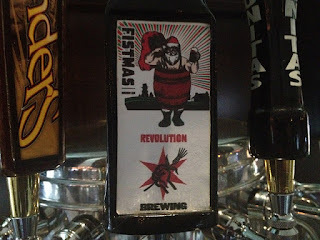 Fistmas is Revolution's red ale, and it's brewed specifically for the holiday season. Normally, when you think of a seasonal beer like this, you will expect to get notes of pie spices or brown sugar. This one is much different, featuring sweet and toasty malts with hints of ginger root and orange peel. The orange is subtle, yet it balances the bitterness where the hops might otherwise overpower the finish. (Might I add, it's got a phenomenal lingering finish.) It has a deep reddish amber color and aromas of baked bread, caramel and stone fruits. This is a different take on the traditional holiday beers you may be used to, so come experience the Revolution. At 6.1% ABV, this beer has a bit of bite as well. Located on the northwest side of Chicago, the Kedzie Avenue brewery is a 60 barrel brew house. Revolution produces about 50 different beer styles each year. Founder Josh Deth started by cleaning kegs at the Golden Prairie Brewing company. As he became more interested in the beer-making business and moved to the infamous Goose Island, his interest evolved into creating Revolution. Although it took a few years to collect the funds and put together the ground work, by February 2010 they were up and running. Today, Revolution Brewing has received local and national recognition with awards from the Great American Beer Festival. 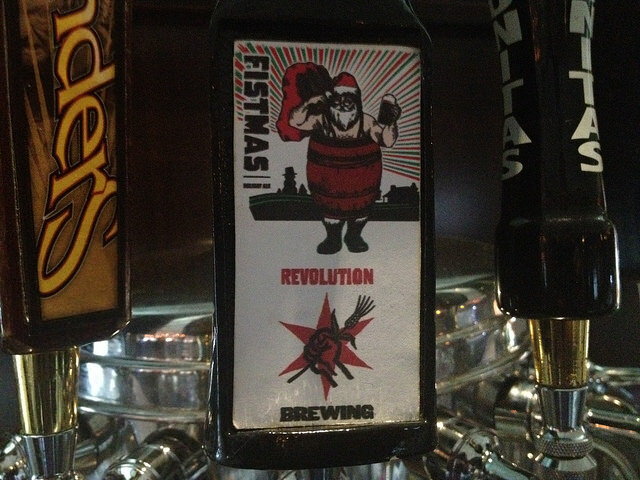 Come down this week and enjoy a glass of Revolution's Fistmas Holiday Ale. It will not last long.